It is sometimes desirable to skip some statements inside the loop or terminate the loop immediately without checking the test expression. In such cases we can use break statements in Python. The break statement allows you to exit a loop from any point within its body, bypassing its normal termination expression. 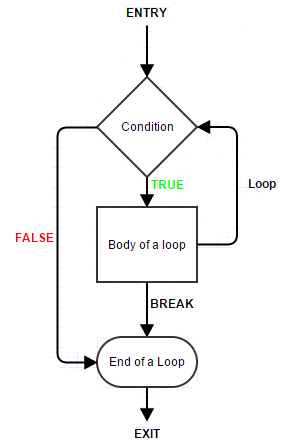 As seen in the above image, when the break statement is encountered inside a loop, the loop is immediately terminated, and program control resumes at the next statement following the loop. In the above program, when n==5, the break statement executed and immediately terminated the while loop and the program control resumes at the next statement. Continue statement works like break but instead of forcing termination, it forces the next iteration of the loop to take place and skipping the rest of the code. In the above program, we can see in the output the 3 is missing. It is because when n==3 the loop encounter the continue statement and control go back to start of the loop.